Honda has recently announced that they will be able to make a few of their latest vehicle models such as the 2013 Accord a lot safer by incorporating Apple’s Siri™ technology into them. This means that while most modern day vehicles are extremely safe to drive as it is, adding this technology to them will further enhance the levels of safety experienced by drivers and passengers. Drivers can now concentrate more on their driving because distractions will be minimized. Because iPhone play such an important part in the lives of millions of people each day, many of them refuse to turn them off, even while driving. This can have potentially fatal consequences because of the fact that the driver’s attention is drawn to their phone instead of to current driving conditions. By offering these motorists the option of having this technology integrated with their compatible iPhone model, it will prevent the phone screen from lighting up while driving which will help reduce the chances of drivers becoming distracted. Offering Siri™ to these drivers along with their Eyes Free mode will also make sure that drivers keep their eyes where they should be – that is on the road ahead. 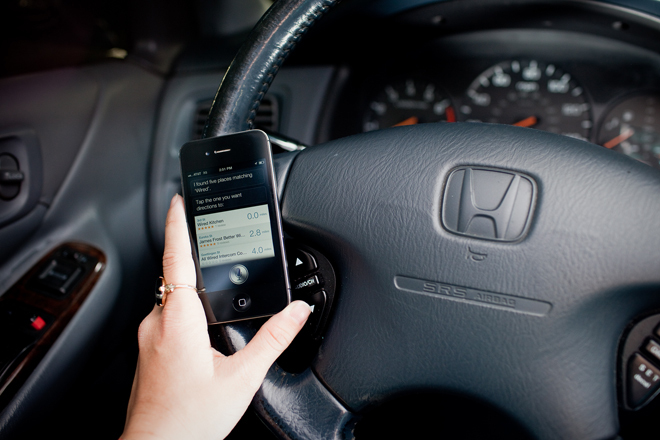 Combining Siri’s functionality with Honda’s Bluetooth Hands Free Link system will ensure that the driver’s need of staying in touch with colleagues and family is maintained while still ensuring their safety while driving. This is because Siri™ is able to respond to voice commands, thus helping the driver to keep their hands on the steering wheel as much as possible. This system has the ability to be integrated into the 2013 Accord through the on-board speakers and microphone situated inside. Instead of drivers having to physically pick up and hold their phone while driving, all they will need to do is give the correct voice commands and they will be able to safely make and receive calls in their vehicles. When it comes to integrating the latest forms of technology into vehicles, Honda definitely seems to be leading the race among vehicle manufacturers. By keeping abreast of current technology trends, they are able to offer their customers the best and most convenient forms of technology available. Integrating Apple’s hands free technology into their vehicles is just one example of their call to offer innovative communication solutions to their customers. With this being said, it may still be a short while before we know whether this technology will be made available in any of their other models or not. Customers who wish to use this hand free solution in their 2013 Honda Accord should make sure that Siri™ and her advanced technology are in fact available in their area beforehand. There may also be various data charges that could apply while using this service, depending on which network provider and cell phone package are used. It is also important to inquire whether your chosen language option is available prior to purchase. Andrew Barber is the eMarketing manager at Rockingham Motors. Rockingham Motors is a Toyota, Honda and Scion dealership located in Salem, NH.